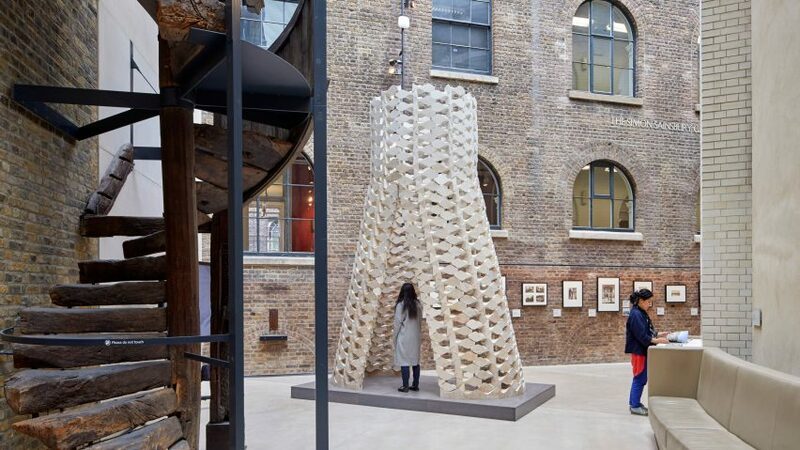 Robots cut the curvy blocks that make up this stone tower, which Palestinian studio AAU Anastas has built in the V&A's Simon Sainsbury Gallery Prince Consort Gallery for this year's London Design Festival. Each of the stone blocks that make up the While We Wait structure has an undulating form and sloped edges, which allows them to be stacked up to form the self-supporting latticed tower. To achieve the correct geometry for the stone blocks, which each slightly resembles the shape of a fish, the architects designed them on the computer. They were then cut by robots, and finished and assembled by hand. The Bethlehem-based studio's founders, Elias and Yousef Anastas, designed While We Wait as part of their research into contemporary stone construction methods. The aim of the project is to reveal new possibilities for building just with stone, and the duo has already built an arched latticed canopy in Jericho from 300 mutually supporting blocks as part of it. Elias and Yousef said they started the project after seeing the use of stone in their home country diminish from the primary building material to cladding. "In Palestine we have a law that was inherited from the Ottoman Empire where we are obliged to use stone as a primary construction material in the facade and elevations of buildings," the architects told Dezeen. "It passed from using stone as a construction and internal component to only a cladding material that is being used only for the wrapping of buildings." All the stone in the pavilion was sourced from different areas of Palestine, and features a variety of hues as a result. The architects arranged the blocks to make the most of this, fading from subtle reddish tones at the base, to pale limestone at the top. A pair of triangular openings allow for visitors to pass through the structure and an open top offers views straight up to the glass roof of the gallery. Following its stint at the V&A, While We Wait will be shipped to Bethlehem's historic Cremisan Valley, which runs between the West Bank and Jerusalem. Elias and Yousef Anastas intend the structure to host protests against the extension of the Israeli separation wall, which would partition Christian town Beit Jala from the Jewish settlements of Har Gilo and Gilo. Local monks have arranged the protest against its construction as the barrier would loop around a historical monastery. "[The monastery] is currently being threatened to be cut from Bethlehem by the separation wall that actually is passing through the valley, placing the monastery and the whole valley on the Israeli side so it won't be accessible any more to the Palestinians," the architects explained. "The local community of monks created gatherings few years ago where they meet around and in the valley, and tried to meditate around the valley, and protest passage of the wall." While We Wait will be on show at the V&A throughout London Design Festival 2017, which runs until 24 September 2017. Other installations at the museum include a 21-metre-long fabric snake by British designer Ross Lovegrove and a colourful hall of light by Australian designer Flynn Talbot.